Our Day of the Dead dioramas show miniature skeleton scenes behind glass. 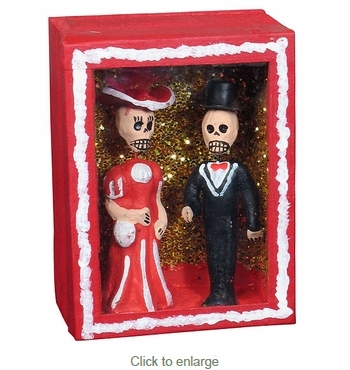 This festive skeleton Catrin and Catrina couple was created with clay and hand painted by Mexican folk artists in the tradition of artist Jose Guadalupe Posada. They are encased in a colorful painted wood box with a glass cover.